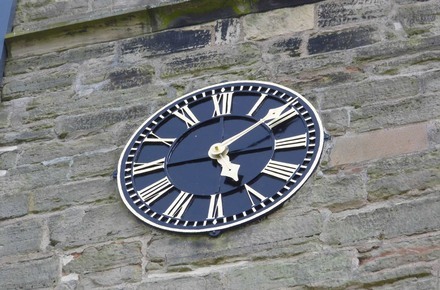 The clock was installed in 1856 by Messrs Cope of Radford in Nottingham. It was built in 1854, and includes an armchair strike with 4ft solid dial, as evidenced by the engraved minute dial, which shows the position of the hands inside the tower. It was funded partly by subscriptions and partly by Church Rate. On the outside you can only see the four-foot single skeleton dial on the north wall of the tower. Behind the dial face, beyond the two-and-a-half foot thick wall, is the driving mechanism built by Reuben Bosworth of 65 Upper Parliament Street Nottingham. Bosworth was making clocks between 1832 and 1877, first from 65 and later from larger premises at 110 Parliament Street. During restoration work in 1896 the tower was pulled down to nave roof level and the stonework, battlements and pinnacles carefully restored. The church clock was thoroughly cleaned at this time, the striking apparatus was repaired, and a suitable case was made for the works. The clock is now keeping excellent time. The clock frame is a cast iron framework of bars known as a double frame movement or a chair frame. The back of the chair is the narrow frame containing the gears for both the going and the striking trains. The lower part, the chair seat, is the wider frame for the two winding drums. The pendulum is eight foot six inches in length and swings every one and a half seconds. The escapement is a 'French Pin Wheel' dead beat type. The escapement has a set of pins sticking out of it at right angles, which fall on to two plates on the pendulum, which allow one pin to pass with each swing of the pendulum. The clock keeps very good time when in good repair and only needs winding once a week. 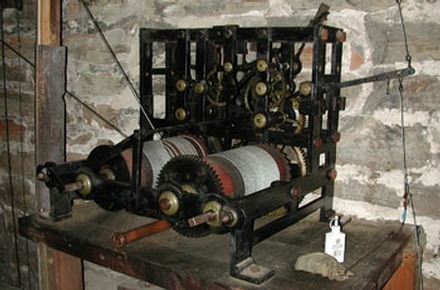 The driving weights fall down a shaft from the height of the clock to ground floor level. The hours are struck on the tenor bell. It was decided to spruce up the clock for the 1951 Festival of Britain celebrations. The estimate for it's re-painting (with gold leaf) and a new copper backing was £35. There was a general appeal to fund this work with some of the money raised coming from, Ernest Foster £1; Mr Savidge £5; a box at the Exhibition and Post Office £4.15s.2d (making a total of £34.19s.9d). Later in 1965 some minor repairs were carried out. The mechanism was again dismantled and cleaned on site in 1984. By January 1985 the clock face had been reguilded. In 1985 the clock was removed and taken to Smiths of Derby for a major overhaul, as the movement is over 100 years old and a good specimen of its type, and despite considering alternative modern clocks, it was decided to complete this major overhaul so that future generations could see a true piece of old craftsmanship. Our anonymous donor agreed this was the right course of action even though the cost would be at least £155. 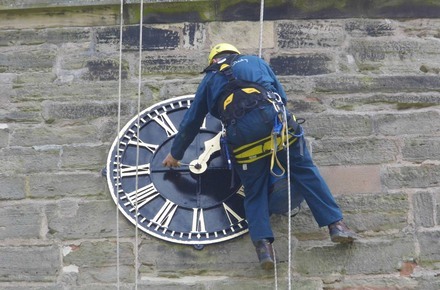 The repairs were completed and the clock re-installed. Since then it has been serviced on an annual basis by Smiths. In March 2001 the dial works were dismantled and removed for cleaning and for relining the strike weight pulley and top guide pulley. Top left: The single clock face. Top right: The clock mechanism. 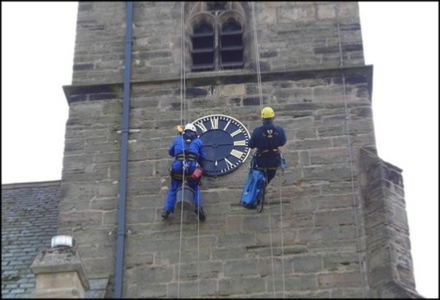 Stopping the clock for removal of the bells March 2008. 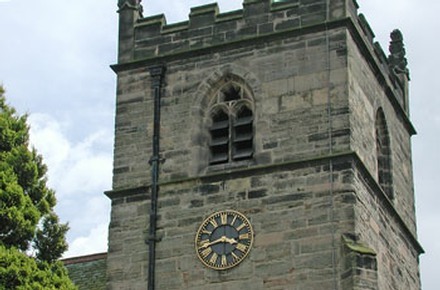 Once the decision had been made by the PCC to accept a bequest from the will of the Late Mannie Foster for a new bell to be cast and installed along with the five bells already in the tower, it was clear the clock would have to be stopped for the duration of the work to the tower and belfry. 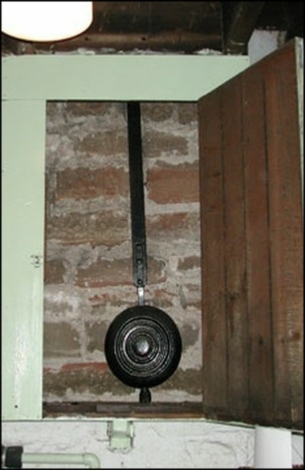 The clock was protected by a timber box surrounding the mechanism, also with the addition of plastic sheeting to stop dust and debris from getting to the moving parts during the period of work. Left: Tower captain, Stephen Smith, stopping the clock prior to installation of a protective box. It can be seen how necessary this was in the above right photograph. The clock was to be stopped on 24th March 2008. This work would last just over three months and the clock was restarted in the first week of July 2008. Once the protection was removed the clock was rewound, the hands were adjusted to the time and the pendulum moved to activate the clock. 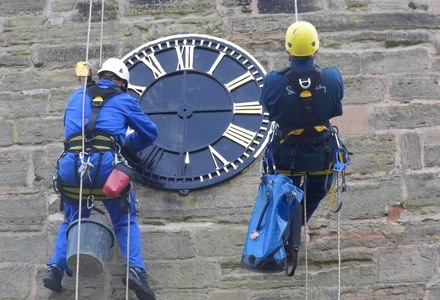 June 2015 saw the clock face repainted and the mechanism serviced, by clock engineers from Smiths of Derby. Photographs below provided by Emma Waite. Some extracts also taken from back issues of the Woodborough Magazine. Written with the assistance of Stephen Smith (tower captain) and horologist, Roger Martin.